After spamming my way through your Facebook and Twitter pages for the past month or so, here I am, at the end of the competition, triumphantly on the lead of the pack. I do feel like I have achieved something. It’s not so much winning the competition, because as you might or might not know, I am not going to run to Hollywood to sign a movie-rights deal with Steven Spielberg or something, but I feel like what I have reached is bigger, and better. I have won your support. "Your blog is so frothy and witty and fun that you make us feel like everything is alright and that you are looking at your future as a parent with optimism...” “… are you not scared of the difficulties that lie ahead? Your son’s first day at school? The time when his class will find out that he has two daddies?” They were not being sarcastic, simply they were asking me if perhaps I had detached myself from reality a little. But the answer is no. No way. I can’t afford the luxury of detachment. 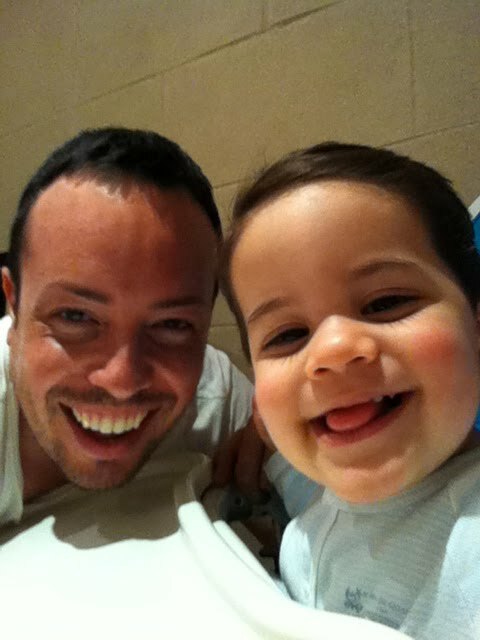 I am well aware of all the challenges every gay parent will have to face, but I chose not to focus on the issue and dedicate a blog to it. That would have been a waste. First because narrow-minded people will always be around, even in the most accepting society and it’s way more productive to send out a positive message to all, rather than starting a battle to change the minds of the few. Second because we all know already what the obstacles in our lives as parents are and I believe that by discussing over and over again about them, I would only end up making them bigger than they actually are. In my head that is. I tend to be a little paranoid you see… We are a regular family, with regular issues and regular dynamics. We are not flying the flag of diversity because we feel we don't need to. We are just like everyone else. We don't do parades, we don't do LGBT Families Conventions. We are just another family. What makes us and breaks us are the same things that make and break any other family. We don't need to be handled with care, just with respect. The same respect we give to others. If you want to refer to us as "The gay family", then I will assume it's because you have been too lazy to find a more befitting adjective, like 'sweet', 'lovely' or 'nice'. Perhaps you don't know us well. I hope one day you will. No, I don’t think it’s denial, it’s “cautious optimism”. To look at life with optimism, to trust people and their innate goodness. To be able to enjoy that goodness. To gather it up as our strength and face difficulties knowing that we are not alone. Anyway, at least this is what I am wishing. When difficulties loom, our motto as a family is “We’ll cross that bridge when we’ll come to it…”. And I believe that we will have a lot of people around us, to help us with that crossing. The point is that we might not even ever get there. Maybe there wont be a bridge to cross for us. Perhaps we are already on the other side. Perhaps this is me still looking over to the 'other' side. The one that scarred me and made me just that little bit more insecure than the rest of you. I am very optimistic. Cautiously. But I also know that no man is an island. We all need each other. We all need support, and I am glad to have yours. My I got heavy…..
See you all here next week, and thanks again, from the bottom of my rainbow-coloured heart.